I love all my dogs. I have two purebred collies I bought from breeders, Lucy and Levi, and I have four rescue dogs, Angel, Chase, Tatum and Muffit. Of all my dogs Chase has the most potential to go far in the dog sports I love. I am certain he can get a UD in obedience as soon as I start training him up. But none of my other dogs would be capable of it. Levi maybe would have been, if he’d had the right training as a puppy. Lucy had too many physical problems, though fortunately not mesothelioma. Tatum, Angel and Muffit are wonderful dogs but I don’t think will be able to really go far in dog sports. Even getting a pet dog that is well socialized is very important. The first weeks of their lives puppies need to experience lots of people and things. If they miss out on this, they will have harder times when they are older. So three weeks from today I’ll be on a plane to pick up my new puppy! 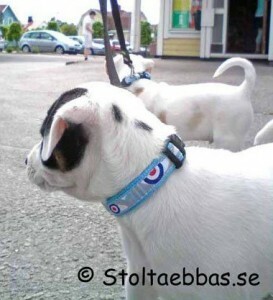 Isn’t he sporting a gorgeous blue collar! And he is getting an amazing, wonderful, perfect start, thanks to his breeder. I don’t think even Lucy or Levi had great starts from their breeders. So I am going to love having a well bred and well socialized puppy to work with and love! I can hardly believe that after all the waiting…that it’s only three weeks away now! LOL Course it’s going to be a long three weeks I’m sure, but still. I find it a real shame that people cannot understand this, it’s particularly worse for owners that take on a young dog that hasn’t went through proper socialization etc because mst aren’t understanding of what is needed to fix these problems. although I do say this it would be evry hard if every new dog owner were to look for this trait and then turn the dog down, because it happens all too often. .-= MMDogTraining101´s last blog ..How to Train Your Dog to Stay, Teach Your Dog to Stay =-.